I ran into Mustafa last week in the Bronx. I was walking down the street when I saw him out of the corner of my eye. He was smoking a blunt and shooting dice in a parking lot. With a bunch of illegal aliens of course. The kind that wouldn't be safe walking the streets of any town in Arizona. I headed over to the lot to take a closer look at the action. And to inspect everyone's papers. I wanted to make sure everything was in order. Welcome to the GDR and East Berlin. Or the DDR as Dirk Nowitzki would say from his couch while watching the NBA playoffs on TV. One and done is no fun. Hell, Dirk could do that playing for the Knicks if he wanted. Lebron James would look nice in a Knicks uniform. So I got high with Mustafa and the aliens. Then joined in on the action. We both won a shitload of money shooting dice that day. The illegals walked off in shame. Back to work for them. At least we didn't report them. As Mustafa would say, "If you sneak in. You're in. Just ask Ben Roethlisberger." Mustafa then compared himself to Antonio Cromartie. He's got 7 kids in 5 states too. Where's Shawn Kemp when you need him? 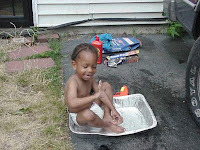 Here's Mustafa's youngest kid "chilling out like a pimp in his ghetto swimming pool." Time to buy a real pool bro. I know where the financing is coming from. But who's going to install it?